Vallecamonica is one of the most important archeological sites in the world for rock carvings. One of the most represented rock symbols, the Camunian rose, is the symbol itself of Lombardy region. Probably only a few know that of all the 50 Unesco’s World Heritage Sites in Italy – the highest concentration in the world – the first one was in 1979, in Lombardy. More precisely in Val Camonica, a valley in the province of Brescia, where there are some unique-of-a-kind rock carvings, indeed one of the largest collections of prehistoric petroglyphs in the world. 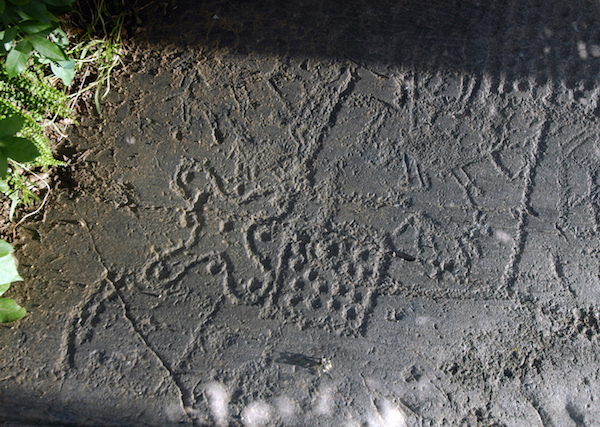 Estimates say that the total number of petroglyphs present in Vallecamonica is about 200,000 or even 300,000. With rock carvings scattered in more than 180 different locations belonging to 24 villages, crossing more than 12,000 years of history, the Camonica Valley is commonly known as “the valley of signs“. First of all: what are petroglyphs? Petroglyphs are engravings carved into the rock by menas of peaks of rock and chisels using a scraping technique to scratch. Their appearance is linked to that of Homo sapiens, about 100,000 years ago, and they constantly evolved during the course of time. Tracing the evolution of rock carvings means – first of all – to trace also the evolution of the human race, from the Paleolithic down to the Bronze and Iron Age. In all the world petroglyphs are found mainly in areas of pastures, near lakes and water sources. Vallecamonica, due to its peculiar position, near the mountains and Lake Iseo, and due to the particular type of rock, sandstone of Permian origin, very fine and with siliceous cement, polished by glaciers, was the ideal spot for rock carvings. Valle Camonica’s rock carvings mainly depict schematic images more similar to ideograms than to real images. Their function was related to celebratory, initiation or propitiatory rituals, an outstanding evidence of the anthropological evolution of man. The rock carvings in Vallecamonica covers a period of 8,000 years. The oldest figures date back to Paleolithic period, immediately after the retreat of the glaciers that covered the valley. Probably they were made by nomadic hunters who came by since they depict large animals (elk and deer), typical prey of that period. The maximum flourishing of rock art was in the Neolithic period (mid-IV millennium B.C. ), with the birth of the first permanent human settlements. The rock carvings of this period depict fields and agricultural scenes, also related to the introduction of new farming techniques such as the plow. In the later age (Copper Age) the carving representations are especially of statues, flower-stalks and compositions with animal and human figures but also new elements like wheel, wagon and metal objects, even with ritual meanings. The rock carvings kept evolving also in the Iron Age (first millennium B.C. ), ending with the arrival of the Romans (from 16 B.C). Vallecamonica is a valley in northern Italy. The Vallecamonica’s rock carvings were first reported in 1909 thanks to the work of German archaeologist Waelther Laeng. Interest of scholars grew only in the ’20s. In the ’30s fame grew thanks to the ideological interpretation of the carvings from a pro-Nazi point of view: the carvings were seen as evidence of the supposed Aryan superiority. Today the rock carvings of Valcamonica are kept within 8 different theme parks, the first of which, the park of Naquane, was created in 1955. The 8 parks are all very different. It is possible to choose the park that best suits your needs and interests. Paths are all with varying degrees of difficulty; some are on flat routes, others along mountain trails, with very different landscapes and natural features. It is advisable to take part in guided tours, available both in Italian and in English. Every year there are also educational and archaeological camps with survey and analysis of the carvings. It is also possible to visit the Camonica Valley’s National Museum of Prehistory to learn about aspects of everyday life of the ancient inhabitants of the valley.